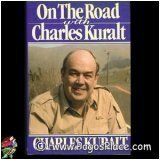 Charles Bishop Kuralt was born on this day in Wilmington, North Carolina, USA, in 1934. It is the 79th anniversary of his birth. He was the oldest of three children born to Wallace and Ina Kuralt. His early childhood was “on his maternal grandparents’ tobacco farm in Onslow County.” [UNC.edu] Charlie Kuralt was one of those kids who always seemed to be telling a story. He sold his first — a yarn about how a dog got loose on a baseball field — when he was just a pup himself. When he was 11 his father got a job as Director of Public Welfare in Mecklenburg County and the family moved to Charlotte. He attended Alexander Graham Junior High and Central High School. where he wrote for the school paper and broadcast local sports. He graduated from Central in 1951 and entered the University of North Carolina at Chapel Hill in the fall. He was a History major and edited the school newspaper and worked for WUNC (UNC’s radio station). After graduating from UNC he worked for The Charlotte News. He won the Ernie Plye Memorial Award for the work he did on his “People” column for that newspaper. 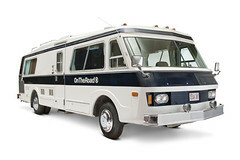 The series carried Kuralt more than a half million miles on repeated visits to all 50 states. The series brought viewers sights of an America they did not see every day, of molasses farmers and sharecroppers to brickmakers and 104-year-old distance runners. In 1980 he left the Road for his swivel chair on CBS’ “Sunday Morning.” He anchored that show until his retirement in 1994. 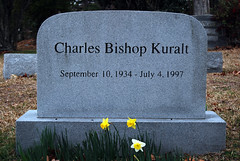 Kuralt died from complications of Lupis on the Fourth of July, 1997. This entry was posted on Tuesday, September 10th, 2013 at 6:55 pm	and tagged with CBS News, Charles Kuralt and posted in Charles Kuralt, postaday, Thought of the Day, Today's Birthday, United States. You can follow any responses to this entry through the RSS 2.0 feed.